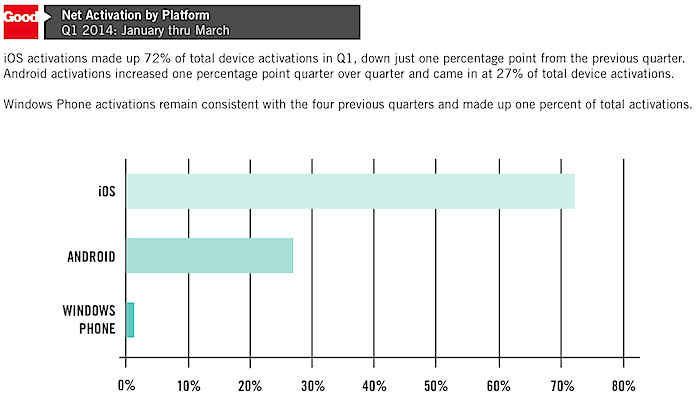 Compared to the Good's previous quarterly report, iPhone now accounts for 51 percent of activated smartphones (down 3 percentage points over the previous quarter) while iPad accounted for 92 percent of tablets (up 1 percentage point) activated by the more than 5,000 companies using Good's services in the first quarter, giving iOS a 72 percent share of all mobile devices. 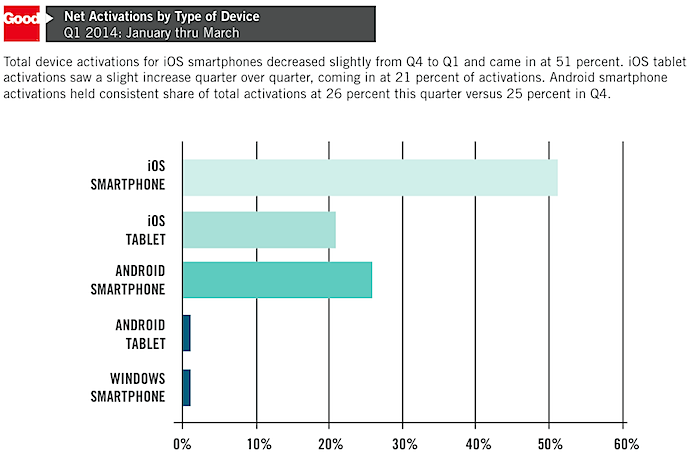 Android phones were up by one percentage point over the previous quarter to account for 26 percent of phones, but made the opposite move in tablets, where the software distribution now accounts for 8 percent of new enterprise tablets. "Windows Phone activations remain consistent with the four previous quarters and made up one percent of total activations," the company stated. 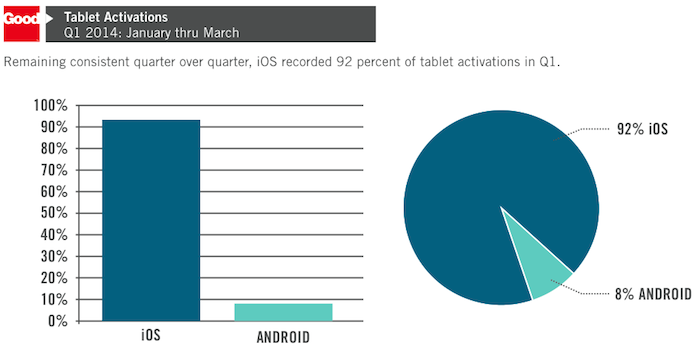 Good also noted that "tablets recorded twice the number of enterprise app activations versus smartphones this quarter, likely attributed to form factor." As is evident from the global shipments of devices compared to their appearance in usage stats, tablets are not being used or purchased like smartphones, creating an differentiated market segment that is having the most significant impact on conventional PCs. Good provides push messaging, device management and security products for corporate mobile users, serving as an alternative to RIM's BlackBerry Enterprise Server. As such, Good supports mobile platforms outside of RIM's own, including Microsoft's Windows Mobile, iOS and Android. Three months ago, Good noted that, "as many organizations are migrating away from BlackBerry to meet end user demand and embrace newer platforms like iOS and Android, they are deploying Good's cross-platform solution to secure both their data and devices." In view of Apple's dominant 72 percent share of mobile devices, Good also pointed out, "not surprisingly, iOS enterprise app activations mirror the stronghold iOS continues to have on the device market and recorded 93% of total app activations this quarter." The firm stated that "custom app activations grew 77 percent quarter over quarter, a significant jump in the 55 percent growth reported in Q4 2013. "Other app categories that saw notable growth of over 100 percent quarter over quarter include mobile printing, notes and mobile unified communications, highlighting the growing trend of organizations moving beyond tasks like document editing and management and supplementing their mobile app strategies with more advanced, sophisticated apps." Good cited a December report by the Ponemon Institute, which surveyed "IT and IT security practitioners with involvement in endpoint security," noting that "sixty percent of these respondents noted the biggest threat is the growing number of employees and others using multiple mobile devices in the workplace followed by the increase in personal devices being connected to the network." However, "rather than be deterred by these security concerns, the data from this quarter's Mobility Index Report shows that Good's customers are taking steps to mitigate them," the company noted. "They are prioritizing providing VPN-less access to enterprise data, while maintaining the highest level of security around that data, through secure browsing apps. And they are leveraging secure development platforms like the Good Dynamics Secure Mobility Platform to build containerized custom apps to meet the ever-growing mobile needs of customers, employees and partners, without compromising on security."